In Charles P. Graham’s sequel to 2014’s Survive! 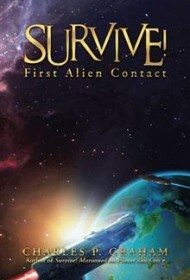 Marooned on Planet Tau Ceti G, the author chronicles the dramatic extrication of a lone crewmember stranded on a remote world and the complexities that arise when rescuers arrive and find hostile aliens near the planet. After a meteor storm destroyed the United Earth Space Force (UESF) ship Copernicus as it orbited a newly discovered planet, the few surviving crewmembers that made it to the planet’s surface are eventually rescued and brought home. But 42-year old astrophysicist Valory Jeanne is left behind, stranded in the derelict remains of the ship. As she struggles to survive, a former Copernicus executive officer, Caitlyn Carver, is named the new captain of the cutting edge spacecraft Orion. Accompanied by her fiancé Chris Elliott (a xenobiologist from the Copernicus), the ship’s first mission is altered when a message inexplicably arrives through a wormhole: someone is alive back in the remains of the Copernicus! The rescue is quickly complicated, however, by a ship powered by and featuring virtually untested technology—and to make matters worse, once the Orion reaches the planet, it’s attacked by alien spaceships. The best science fiction adventures are not only visionary but also filled with an undeniable sense of wonder. Unfortunately, those elements are missing here. Readers who enjoy action above all may appreciate this novel, while those looking for more story development will likely find it lacking.